Modern object-oriented software is inherently complex and has to cope with an increasing number of exceptional conditions to meet the system’s dependability requirements. 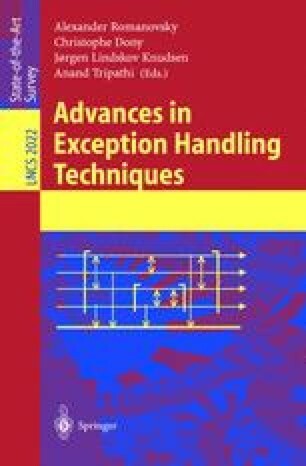 In this context, the goal of our work is twofold: (i) to present an exception handling model which is suitable for developing dependable object-oriented software, and (ii) to provide a systematic approach to incorporating exception handling during the design stage, that is, from the architectural design stage to the detailed design stage. The proposed approach employs the computational reflection concept to achieve a clear and transparent separation of concerns between the application’s functionality and the exception handling facilities. This separation minimizes the complexity caused by the handling of abnormal behavior and facilitates the task of building dependable software with better readability, maintainability and reusability. This work has been supported by CNPq/Brazil under grant No. 141457/2000-7 for Alessandro, and grant No. 351592/97-0 for Cecìlia. She is also supported by the FINEP “Advanced Information Systems” Project (PRONEX-SAI-7697102200).